Killer Characters: Edible Books, Anyone? I’m thinking of organizing an Edible Book Festival at Yon Bonnie Books. Have you ever been to one? They’re loads of fun, especially for cozy mystery readers who love punny titles. People come up with the most amazing creations. Some entries are culinary wonders and truly beautiful. Others are strictly for the laughs. Part of the fun is documenting the entries and sending the photographs to the official website, and then eating them. Take a look at the gallery of entries from past years and prepare to be in awe, to be tickled, to drool, or to just shake your head and groan. Back in Illinois, in the B.S. (Before Scotland) Era of my life, I went to the festival at the University of Illinois three or four times. I even ran into our author at the 2008 festival. That’s the year she won 2nd place for Literary Merit with her entry “The Chard in the Scone” which you can see above. Prescient and appropriate, considering the title of our new book, don't you think? Below you’ll see some of the ideas Christine, Tallie, and Summer have come up with for possible entries. They were more into drinkable than edible that night, but as long as entries are consumable, it's all good. Those three definitely go for the punnier the better! So yes, I think we’ll do it! We’ll hold the first annual Inversgail Edible Book Festival at the bookshop, and see what kinds of creative concoctions people come up with. If you could enter, would you go more for the artistic or the humorous? Can you tell which titles we played around with from the pictures? 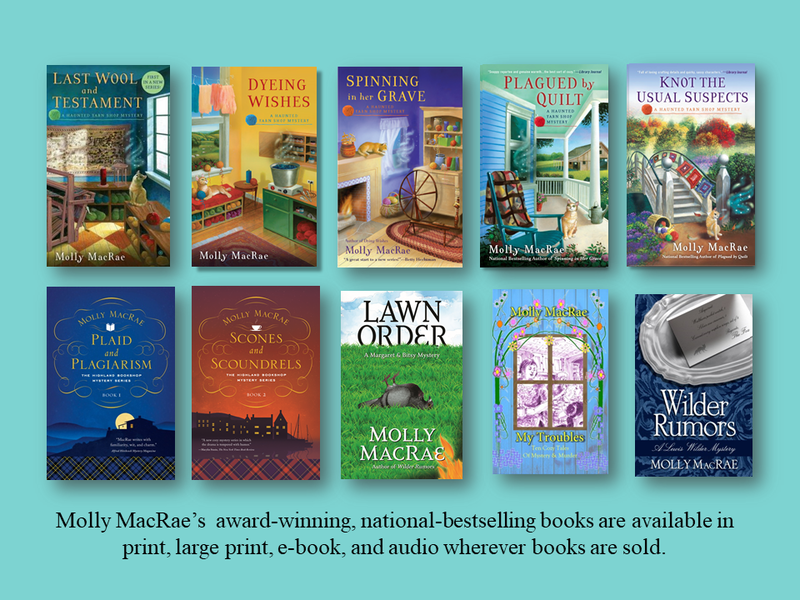 Scones and Scoundrels, book 2 in the Highland Bookshop Mysteries, is available in print, ebook, and audio wherever books are sold. For a couple of delicious scone recipes from the series, visit Killer Crafts and Crafty Killers and Mystery Lovers Kitchen. Molly MacRae writes the Highland Bookshop Mystery series and the award-winning, national bestselling Haunted Yarn Shop Mysteries. Connect with her on Facebook, Pinterest, and Twitter @mysteryMacRae. I had never heard of an Edible Book Festival but what a clever idea. I think bookstores and libraries everywhere should throw these parties. They should, Sue. So much fun! Thanks for stopping by the blog today. Sounds like a lot of fun! I like the To Kill a Mockingbird one the best. I'm partial to that one, too, Sue. Thanks for stopping by today! I'd go for the humourous. Sara Plain & Tall and To Kill a Mockingbird were clever! !